The holiday shopping season is right around the corner or, in some cases, here now. We've already seen Amazon launch its store which contains the "Lightning Deals" it offers each year as an incentive to keep customers coming back frequently. Not to be outdone, Best Buy is kicking off its festivities now as well. The company announces today that deals will be available immediately both in stores and online. Included in the offerings is the iPad Air 2 for "up to $125 off", a Toshiba 55 inch LED TV for $349.99, Insignia 40 inch LED TV for $159.99 and more. As for the actual holiday itself, the store will open at 5pm on Thanksgiving Day. 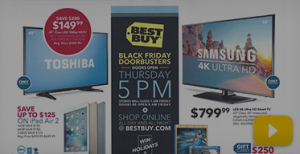 "Nearly all stores will remain open until 1 a.m. local time on Friday, Nov. 27, and re-open for a second round of 'doorbuster' deals at 8am", the company states. That offering will contain such deals as a Samsung 60 inch LED UHD TV for $799.99, effectively cutting the price in half. Also promised are Best Buy gift cards if you purchase certain products such as the Galaxy S6 or a GoPro camera. Other deals will be available on Black Friday as well as throughout the weekend. More information will be available via the store's website.